﻿ MCN Fleet: Winter is coming for the V-Strom! Winter is coming! There’s no doubt about it, the nights are drawing in, the clocks go back next week, the temperature is plunging, the grey murky days arriving and this morning we had our first fog of the autumn. So with that in mind, I thought it was time to fit some winter essentials to the V-Strom 650 XT. I’ll be keeping the V-Strom through the winter, mainly using it to commute to work as well as head to do various features around the country. Whatever the conditions, it’s likely I’ll be riding! Last year I made the mistake of not making any winter modifications to my NC750X long termer, and paid the price! There wasn’t a day I didn’t get to work where I couldn’t feel my hands. Heated grips, therefore, were an essential. When I got the bike, Suzuki said if I wanted heated grips to get in touch. They’ve just released some new ones and were keen to have them tested in the real world. I didn’t hold much hope. Speaking to anyone who had tried Suzuki’s heated grips in the past, there were stories about how they weren’t so ‘heated’ at all. Even Suzuki admitted their older item perhaps wasn’t the best. It’s early days yet, but they seem quite good so far! In current temperatures, the hottest setting is far too hot, so that’s a good sign! While the bike was in for work, I also got a set of Suzuki’s fog lamps fitted as the V-Strom’s headlight isn’t the brightest. When the murky mornings come in, I want to make sure I can both see and be seen. 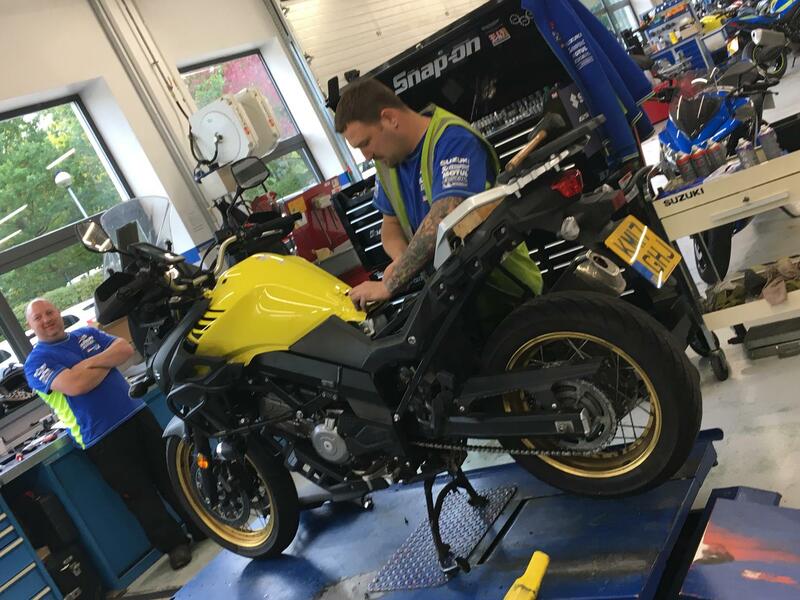 It took about three hours for both to be fitted, and they come at a cost of £270 for the grips and £450 for the fog lamps, which also need the engine bars I had fitted earlier this year. I’m looking forward to seeing how they hold up through the winter.